Why such a big rush to close the investigation? An impartial investigation is a must if the Cambodian government wants credibility. It should allow for an independent team of experts and the protection of key witnesses. The doctor who conducted the autopsies should also be provided protection. This is no closure that can put Chut Wutty’s soul rest in peace. Like Chea Vichea, Chut Wutty had a mission. The two men knew the forces they were facing. They were fearless, they looked straight into the eyes of those who wanted them dead. They both received open threats and knew they would be killed. They walked tall. Their interests go beyond saving one life. The government went after them. The government never did much to prosecute those who wanted them dead. The people know the answer but the government is still “investigating”. Chea Vichea’s brother and the people of Cambodia want Chea Vichea to be recognized as a national hero. That would require a royal decree. The people of Cambodia are still waiting. The least the government can do is to hand over the investigation to an independent team. It starts with the protection of the key witnesses who were in the car with Chut Wutty when he was killed. It also starts with the doctor who conducted the autopsy. What kind of bullet-it hit the knee and traveled up to the stomach. An expert is needed. 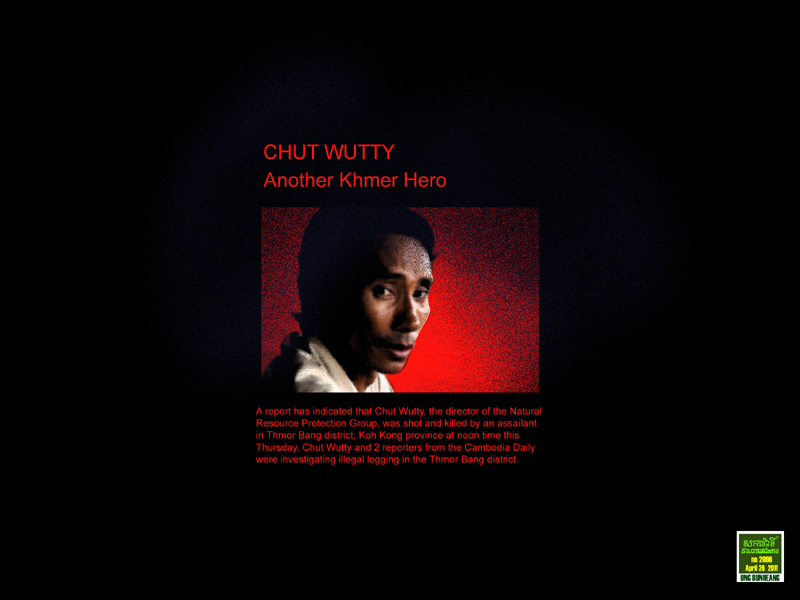 The military police who killed Chut Wutty was also killed. How? Why? The message of both assassinations is clear: heroes are killed because they go against whose protected by those in power. The prime minister of Cambodia has a huge task in his hands: to show credibility and accountability. And it begins with: stop signing deals for land concessions that are more for carte blanche for illegal logging. Does the prime minister know who he signs the concessions to? He should know, if he does not know. The people of Cambodia do not want two-hour long speeches and tirades but action with credibili ty and accountability. Donor community needs to rethink their back-door diplomacy. When is the next donor meeting? Can the date be fixed or should it be indefinitely be postponed? Only 300,000 hectares of Cambodia’s arable land is left. We pray for the souls of Chea Vichea, Chut Wutty and many more heroes who made sacrifices because they want a better Cambodia. More than 36 hours have passed, the body of Chut Wutty is still kept at the hospital in Koh Kong. The family left early this morning to claim the body but heavy paper work and the only ambulance at the provincial hospital is being used to transport a serious patient. Unlikely the body will arrive before midnight to his residence. It is high time we question the strategy of donors-using back door diplomacy to deal with violation of human rights and the sale of Cambodia. It should be reminded that donors have not openly challenged or successful in demanding a set date for a donor meeting with the government. The meeting has been indefinitely suspended by the government with no explanation. Tax payers need to know how assistance to Cambodia get to the people of Cambodia. Tax payers need to know why donors continue to set no conditions on aid. Donor complacency is part of the problem. To Vuthy, land is life and forests is life. His life was always in danger but his soul was as pure as Prey Lang. We need to dig deep, deep down for t he root cause of the problem and the question that we should ask: Who is selling Cambodia to companies? Economic concessions authorized by the prime minister go beyond arable land to pristine forests of Cambodia. He has not heard the cry of the people of Prey Lang. He says : “I will resign if there is any forests lost, any tree cut”. The people of Cambodia have no trust in any investigation conducted by the authorities. Why should we? We want an independent committee with full power to investigate. And we want the end of economic concessions. We want free and fair elections so the people can vote their conscience. We want justice for Chut Vuthy, Chea Vichea, and many more. Launched in 2001, the Advanced Democracy Seminar has taught more than 35,000 Cambodian youth about civic education and civic activism. Hear from three of the program graduates Navy, Theara and Sarith about how they are using the skills they have learned to improve their communities. “We take the words of a person-We take the tusk of an elephant”. For land and forests in Cambodia, we demand accountability of the head of the government.